As a kid I did a lot of boat building, mainly scale models that were not able to sail, although I did actual build a few boats that were, more or less, capable of sailing. I even once build a 10 feet boat, or shall I say raft. I accomplished this with a few friends and we had great fun sailing it on the local river. It was not really water proof and while one person was rowing, the others had to make sure that they removed the water quicker then it was entering our boat. Then sadly one day we failed. I was rowing at the time, and we were in the middle of the river when it was clear we were sinking. I stopped rowing to assist with the hosing, but this only slowed down the process of sinking, it did not stop it. So I started to row again in on effort to reach dry land before we sank, thus avoiding having to swim to safety. And guess what: We made it! Just before the boat really started to sink we managed to jump ashore. Here we watched as our pride and joy slowly sank to the bottom of the river. It was then that we realised we were at the wrong side of the river and this left us with a problem. We either had to walk to the nearest bridge, 10 kilometers upriver, so that would have been a 20 kilometer walk, or swim to the other side. We decided on swimming. We did not see anyone around, so we quickly undressed, and with one hand holding our clothes above the water, we managed to get back to our own side of the river. Just as we were struggling to get out of the water a group of girls from our own school were passing by, and I can tell you we were not happy! This all happened a long time ago and a few times in my live I have had plans of building a boat again. I have spent a good amount of time looking at boat building plans, but with boats size does matter. I usually looked at boats between 30 and 40 feet, but the sheer volume of work involved has always stopped me from going ahead with my boat building plans. Now I have decided to start small. 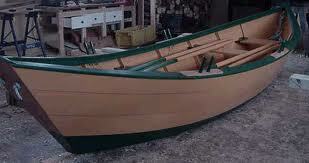 I am going to build a 16 feet Grand Banks dory, which I want to fit with a small outboard engine. I boughtl the boat building plans, I got the working space, and by the time you read this article I might be finished already. Later, who knows, I might build a 40 feet cabin cruiser, and tow my Grand Banks dory behind me. Then, if my cabin cruises sinks, I can always row to safety in my Grand Banks dory, dry and with my clothes on.